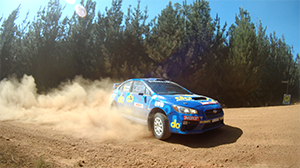 The Subaru do Motorsport team has made a strong start over the first fours stages of Heat One of Lightforce Rally South Australia this afternoon, seizing overall second place following a mechanical mishap for CAMS Australian Rally Championship leader Harry Bates. Molly Taylor and Bill Hayes, in the Production Rally Car (PRC) class All-Wheel Drive WRX STI, were consistently second to Nathan Quinn's Mitsubishi Lancer Evo IX over the quartet of stages. Time problems arose for Subaru do Motorsport's Production Rally Car (PRC) class All-Wheel Drive WRX STI on the day's equal shortest stage, SS3 Blackwood Ridge, when Molly Taylor and Bill Hayes got held up behind the struggling WRX STI of Brad Markovic. Due to the dust, Markovic was unable to see Taylor and Hayes immediately behind – and unaware of their presence - costing the Subaru factory team valuable time. But the real challenge for Subaru do arose on SS4, with front differential vibration indicating a possible gearbox issue, dropping them to 14th on stage and fifth overall. The pair actually stopped momentarily on stage to check the car was sufficiently sound to continue. Subaru do Motorsport's Production Rally Car (PRC) class All-Wheel Drive WRX STI on SS15 with Molly Taylor and Bill Hayes. Time problems arose for Subaru do Motorsport's Production Rally Car (PRC) class All-Wheel Drive WRX STI on the day's equal shortest stage, SS3 Blackwood Ridge, when Molly Taylor and Bill Hayes got held up behind the struggling WRX STI of Brad Markovic. Due to the dust, Markovic was unable to see Taylor and Hayes immediately behind – and unaware of their presence - costing the Subaru factory team valuable time. Subaru do Motorsport Molly Taylor and Bill Hayes testing for the 2017 Forest Rally. Molly Taylor and co-driver Bill Hayes used the ultra-reliability of the Les Walkden Rallying-prepared WRX STI to advantage, bagging maximum points, to provisionally elevate the team to second spot in the championship after two rounds. Molly Taylor and co-driver Bill Hayes, in the Production Rally Car (PRC) class All-Wheel Drive WRX STI drove to third* place in Heat One of the National Capital Rally. Subaru do Motorsport team is in a super-tight contest for leadership of the CAMS Australian Rally Championship 2017, following a superb second place on Leg Two of the National Capital Rally, ACT, today. Molly Taylor and co-driver Bill Hayes, in the Production Rally Car (PRC) class All-Wheel Drive WRX STI, fought a war of attrition as wet morning weather played a key factor close to the national capital. While Championship points have yet to be announced, Nathan Quinn, the leader going into the Canberra event, will likely have forfeited top place to either Harry Bates or Molly Taylor, after losing valuable time with a puncture on a morning stage, relegating him to 4th in the rally at the day's end. A sixth place finish on Heat 2 of The Courier Eureka Rally in Ballarat, Victoria, today secured valuable points for Subaru do Motorsport team in the CAMS Australian Rally Championship 2018, despite a collision with a kangaroo denting progress. The Molly Taylor and co-driver Malcolm Read Production Rally Car (PRC) class Subaru All-Wheel Drive turbocharged WRX STI, in the Les Walkden Rallying (LWR) service area during the rally in Ballarat.